Feeling like an outsider is not unique to any time period or place. While teenagers are prone to be especially cruel to those they perceive as atypical and different, adults can be just as close-minded and horrible, turning youthful immaturities into full-fledged prejudices that govern their lives. As more identities formerly thought to be distinctly “other” become accepted in the mainstream, this problem may lessen, but it still exists in so many circles and communities in various forms. Years ago, hope of treating someone who didn’t fit into an easy mold with kindness and without judgment was far from likely. 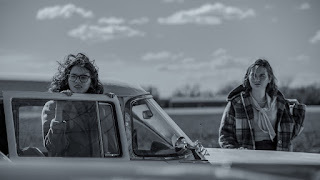 In 1960s rural Oklahoma, Iris Deerborne (Kara Hayward) faces daily harassment from classmates on her walk to work based in part on her appearance and on rumors of her incontinence. 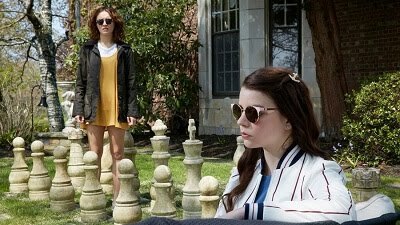 When Maggie Richmond (Liana Liberato) moves from the city and shows up to defend Iris, she begins to see a whole new side of herself thanks to her open and enthusiastic energy. As the popular girls try to lure Maggie away from Iris and into their clique, her presence quickly becomes controversial as the real reason for her family’s relocation begins to become clearer and the people of the town demonstrate their true intolerance for anything they don’t see as upholding their Christian family values. This film is director Martha Stephen’s Sundance follow-up to “Land Ho,” this reviewer’s favorite film from the 2014 festival and the year as a whole. This black-and-white drama, while laced with comedy, doesn’t resemble her previous film at all, moving away from, as Stephens put, two horny old men to two young teenagers trying to find their place within a society that isn’t prepared to accept them for who they are. Maggie’s physical appearance makes her an easier fit, though her reluctance to distance herself from Iris while still playing the game makes her an enigma who is not destined to fully thrive in a close-minded town far too small for her. Both Hayward and Liberato turn in strong performances as the lead characters, and they’re offered considerable support from the adults in the film, including Jordana Spiro as Iris’ miserable mother, Tony Hale in an unexpectedly dramatic turn as Maggie’s controlling father, and Adelaide Clemens as a hairdresser who feels just as out of place as Maggie. This film, which switches gears between entertaining and enlightening as it goes on, offers a compelling and unsettling portrait of life in a conservative town that feels relevant and haunting.